CVS Health’s massive acquisition of Aetna could face heightened regulatory scrutiny amid the Trump administration’s new regulatory regime. 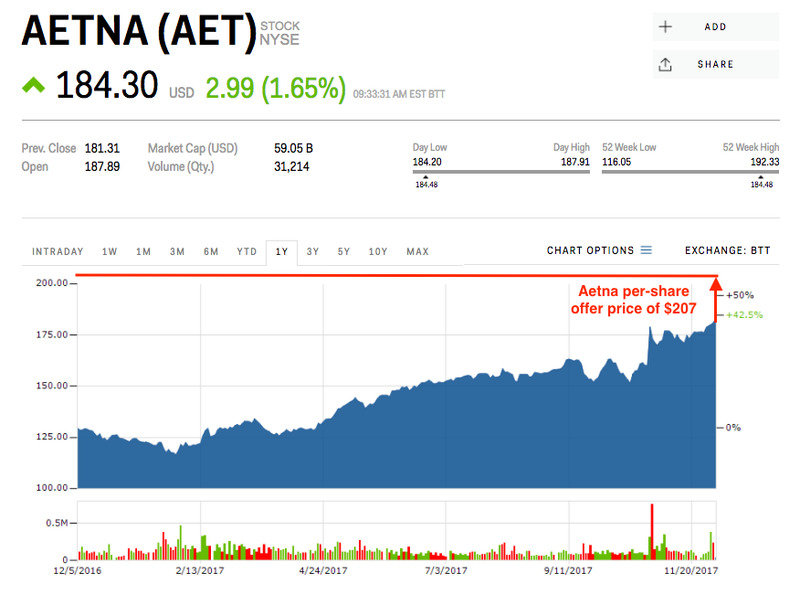 Aetna’s stock is trading about 10% below the per-share offer price, reflecting investor uncertainty that the deal will get approval. A year ago, CVS Health‘s $US69 billion acquisition of Aetna would have probably skated past regulatory proceedings. But things have changed under the Trump administration, and investors don’t look particularly confident that the mega-deal will be approved. This uncertainty around the deal – the biggest to be announced in 2017 – is being reflected by Aetna’s stock, which is trading near $US184 a share, roughly 10% below the $US207-a-share offer made by CVS. This discount serves as a handy gauge of sentiment around the deal – if investors think approval is likely, they will trade Aetna’s shares near the proposed deal price – and its depth at present time doesn’t paint the most promising picture. In the minds of investors, the deal’s sticking point is Makan Delrahim, the US Department of Justice’s new antitrust chief. In his short time on the job, he’s been less receptive to so-called “vertical” mergers, which involve the combination of two companies that hold different places in the same supply chain. Case in point: Delrahim’s recent handling of AT&T‘s attempted acquisition of Time Warner. While it may appear to be a textbook vertical deal, the Justice Department has sued to block it, calling the deal anti-competitive and warning against higher monthly television bills for customers. So the question now becomes: will Delharim, and by extension the Trump administration, be as tough on future vertical mergers as they have been on the AT&T/Time Warner deal? Are they leading a new crusade against this type of deal, or was that a specific case driven by a personal agenda? And that, in turn, would likely boost Aetna’s stock price closer to the offer price of $US207, if not above it. The company’s stock climbed 1.8% to $US184.48 in early trading on Monday. Meanwhile, CVS’s shares dropped 3.2%.